If you are looking for a brilliant and balanced amalgamation of flavours and spices, biryani is the ultimate choice for you. No one can truly understand the true magnificence of Indian cuisine until he or she has tasted the different kinds of biryanis served in India. Although of Persian origin, biryani has become quite versatile, with each part of India having its own variant – each more tasty than the other. So today, we are going to take a look at the top 10 biryanis variants available in India. Read on to find out more. The Kalyani Biryani might be one of the less popular variants of biryani available in India, but this variant is quite popular in the suburbs of Hyderabad. If history is to be believed, the Basavakalyan fort keepers, the Kalyani Nawabs, fed this biryani to anyone who came to the fort to gain access to the Nizam’s territory for business or for an audience. This biryani is usually made with less expensive ingredients, making it a cost effective solution for feeding travellers. The Tehri Biryani is the finest vegetarian biryani available in the northern part of India. This variant became popular during the Second World War, when meat had become an extravagance. The biryani is made with large portions of boiled and spiced potatoes. The vegetarian biryani also was a common dish among the Hindu officers of the Muslim nawabs. The Malabar cuisine is perhaps one of the finest cuisines available in India, and it should not come as a surprise that their biryani is something of a spectacle as well. This biryani is more Arab than Mughlai, which gives it a completely different flavour altogether. This biryani uses Jeerakasala rice instead of Basmati, and coupled with the unique blend of tangy, salty and sweet spices, it becomes a wonderful rice dish. Also known as Ambur biryani, this South Indian specialty is extremely light on the stomach, but tasty at the same time. Its origin can be traced back to the 1900s, when the Arcot Nawabs ruled Tamil Nadu. This biryani is prepared with yogurt, whole spices and dry chilli paste. Usually, this biryani is served with brinjal masala as a side dish, which is prepared in a similar way. 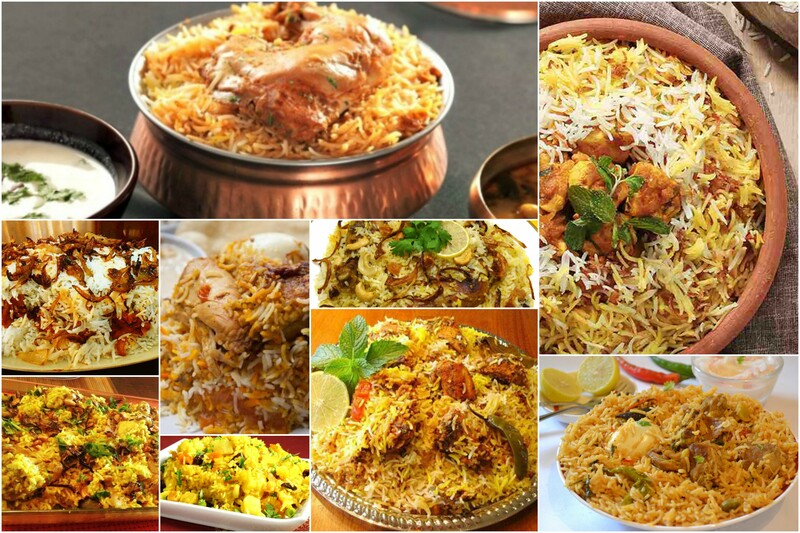 South India has a wide array of biryani variants. The Beary biryani of Karnataka is the perfect blend of perfectly cooked meat, mixed with fragrant rice and spices. Coastal Karnataka, on the other hand, offers the Bhatkali biryani, which is one of the finest dishes of the Navayath cuisine. This biryani is laced with green chillis and sautéed onions, which boosts the flavour even more. The Kampuri biryani is one of the lesser known biryani variants available in India. It is a specialty of the north-eastern states, mainly Assam and the surrounding states. The meat is usually cooked with bell peppers, potatoes, carrots and peas, mixed with nutmeg and cardamom. The use of fresh vegetables makes this rice dish special and unique. Mumbai has always been the heart of the nation, and no food list is complete without at least one dish from the city. So, it is quite natural that the Mumbai biryani makes its place on this list. The biryani is unique due to the addition of dried plums and kewra water, which brings about the sweet yet mesmerising flavour of the biryani. Plus, you get spiced and friend potatoes, which is just perfect. Now we get into the top 3. Number 3 on the list is the Sindhi biryani. This biryani is loaded with coriander leaves, spices, mint leaves, chopped chillies, and many other spices that give it a unique flavour. Tomatoes, dry fruits, onions, nuts and yoghurt are also used in preparing this Sindhi variant. Number 2 on the list is the famed Calcutta biryani. One would simply lose his or her mind if one tries to calculate how many variants of Calcutta biryani there are. There are quite a few specialists like Arsalan and Royal, but other than these, there are hundreds of biryani stores all over the city, each with its own unique failure. The specialty of this biryani is the addition of the kewra fruit, along with boiled and spiced potatoes, and an egg, which is the one unique ingredient of the Calcutta biryani variant. According to popular opinion, the Awadhi biryani is the very first biryani variant ever to have gained popularity in India. This variant originated from Lucknow, all the way back to the Lucknow nawabs, and has a unique similarity to almost every other biryani mentioned on this list, but with its own unique subtleties. The addition of saffron, star anise, cinnamon is a special touch of the Lucknow region. Besides, the method of cooking this biryani, i.e., in a handi with a sealed lid, also known as the dum phukt method, gives it a smoky flavour which is mesmerising.